I'm the girl that has a kitchen full of cookbooks and recipes, but do you think I ever use them? Nope, I don't think I've even used any of them once! Sad for sure. They are pretty much there to make it look like I'm this amazing gourmet cook. When in reality I'm nothing of the sort. Anyway long story short, I found this recipe on Pinterest and just had to try it. 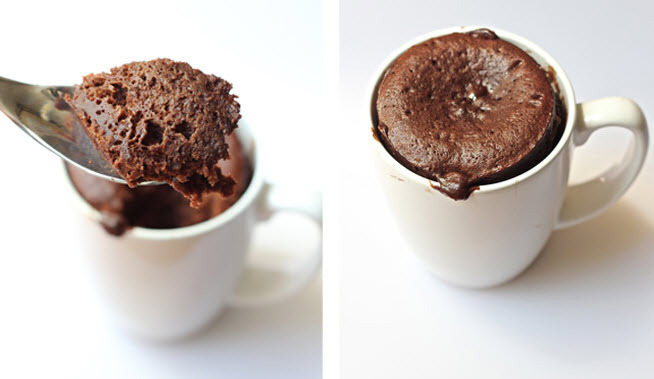 I mean a 60 second cake... made in the microwave... even I could do that! Plus, I figured it was time to actually make something I've pinned. It was rainy and gross all weekend, so warm chocolate cake was just what I needed. OK warning- my pictures are iphone pics, I was WAY to impatient to eat my cake to get out my nice camera and style this properly. One little note- I made this twice this weekend- can we say piggy! The first time I followed the instructions to a T. After my husband and I inhaled it in about 2.2 I realized I should try a low fat version. So the second around I used applesauce in place of the oil. In the end I actually liked the one with the applesauce better- it was AMAZING. mmmmm, all done and smelling so delish! I didn't have any vanilla ice cream on hand, but in the back of my freezer I found a new container of Cool Whip so that's what I used. This is totally something I will be making often. It could NOT have been easier and was so delicious!! PS- I'm thinking of spicing it up next time and using some Cayenne pepper to make a Mexican style chocolate cake, what do you think? 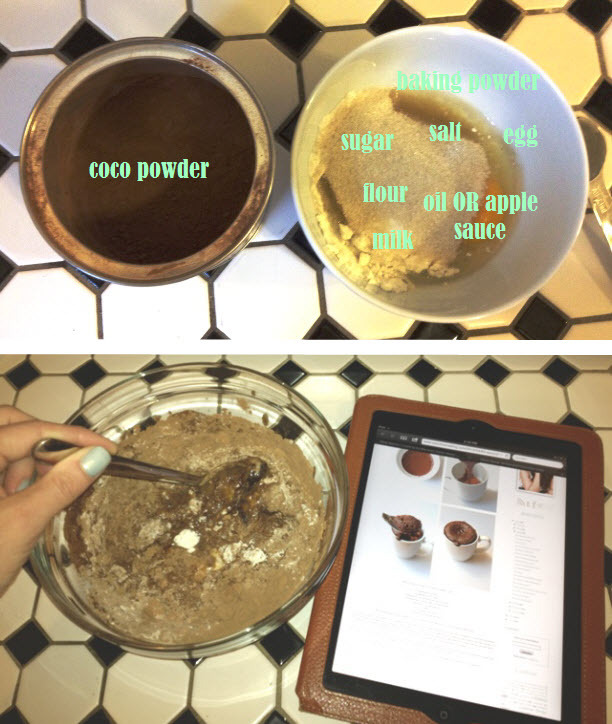 Pinterest TRUTH - love that it was actually easy to make and delicious! I bet it would be super tasty with pepper, too. I made the same thing with my kids a couple weeks ago and was so amazed at how great it tasted - and how EASY it was! Gotta love Pinterest! Oooh I rarely do stuff I pin, but it's always nice to see when one actually works and is actually delicious! Looks so good! I saw that on pinterest too and thought it was too good to be true! OMG...I have to try this, it looks soooo good. Thanks for posting. I'm so glad you liked it! I will definitely have to use applesauce the next time! Ha, I did it too! Actually, my teen did it, and we love it. Mmmm you may have convinced me to try this...tonight. Oh, I'm all over trying this! Looks so yummy. I just had a serious conversation with my husband and children about no more sweets in the house. You just changed my mind!! This looks amazing and great for a quick fix! Nice to find your blog and do the ORC with you! I recently made chocolate cupcakes with cayenne, cinnamon and dark chocolate chips. They were so rich and delicious that there was absolutely no need for frosting. I highly recommend it! I can't wait to try this!!! !